“Did you hear the news that was driving the markets to new records this morning? Since the markets were closed yesterday, there is nothing to update from this past weekend’s newsletter. “That extension, combined with extreme overbought conditions on multiple levels, has historically not been met with the most optimistic of outcomes. Importantly, such extensions have NEVER been resolved by a market that moved sideways. But, ‘exuberance’ of this type is not uncommon during a market ‘melt-up’ phase. Nothing changed this past week as the “melt-up” phase gains momentum. We are on track currently to ratchet the both the fastest and most numerous sequential milestone advances for the Dow in history. Well, as the market opened this morning, the Dow and the S&P both set the fastest pace of a milestone advance in U.S. history as the Dow crested 26000 and the S&P touched 2800. From “QE” to “Low Rates Justify High Valuations” to “Tax Cuts,” the unfettered rise in asset prices has been underpinned by a shifting narrative backing bullish sentiment. The latest, of course, is that “tax cuts” will boost bottom line earnings giving investors a reason to bid asset prices up further. But have the markets already fully “priced in” the tax cuts even before they arrive? 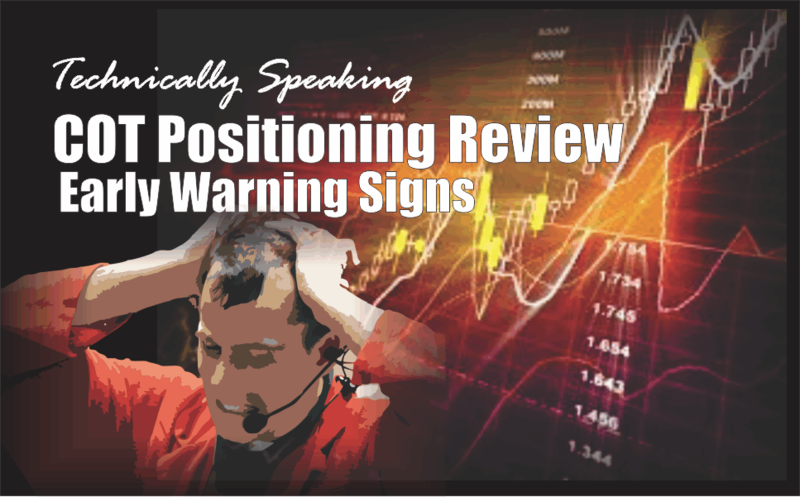 “Zach Scheidt of the Daily Reckoning blog detailed his thoughts in a post Wednesday warning that anybody who’s investing based on these predictions is in for a big surprise as we move through 2018. As Shawn states, a company that posted $5.00 in pretax profits would have an after-tax profit of $3.25 in 2017. Under the new law, that after-tax profit would rise to $3.95 — a big 21% improvement. I don’t disagree with the analysis at face value. However, there are two important issues that need to be addressed. “The statutory tax rate is the legally mandated rate at which corporate profits are taxed. As shown above, the rate has been consistent over the last 75 years except for one significant change as a result of the Tax Reform Act of 1986. “The effective corporate tax rate is the actual tax rate companies’ pay. One can think of the statutory rate as similar to the MSRP sticker price on a new car. It provides guidance on cost but consumers always pay something less. So, back to the math. In reality, a company that earned $5.00 pretax only paid $1.41 in taxes in 2017 on average, leaving an after-tax profit of $3.59, and not $3.25. Under the new tax law that after-tax profit would come in at the $3.95 as stated in the article and the gain would be 10%, or half, of the gain the author forecasted. There is a good bit of difference between a statutory increase of $0.70 profit per share the author assumed, versus the reality of $0.36 per share which is nearly a 50% reduction from the estimated benefit. Secondly, investors didn’t just start estimating the impact of the “tax reform” bill when it was passed in December of 2017. The rally that begins in November 2016 was the beginning of the “Trump Rally” in anticipation of regulatory reform, the repeal of the Affordable Care Act, infrastructure spending, and tax reform. It is worth noting that “tax reform” was the easiest of the four to calculate the beneficial impacts from passage. Therefore, a large portion of the post-election gains are reflective of those expected benefits. The chart below shows the S&P 500 from 2014 to present with Wall Street projections through 2020. The rise in the index is not surprising given cheaper valuations following the “Financial Crisis” combined with more than $33 Trillion in monetary accommodations. Considering reported earnings were deeply negative in 2008, the initial recovery in earnings was quite strong. However, since 2014 earnings growth has been weaker. Despite, minimal growth since 2014, Wall Street believes currently that earnings will rise strongly through the end of this decade. First, while asset prices have surged to record highs, reported earning, estimates for the S&P 500 through the end of 2018 are currently only slightly above where 2017 was expected to end in 2016. Wall Street ALWAYS over-estimates earnings and by about 33% on average. That overestimation provides a significant amount of headroom for Wall Street to be disappointed by year end, particularly once you factor in the “effective” rate issue noted above. Secondly, Wall Street has never foreseen a recession or an earnings reversion until well after the fact. 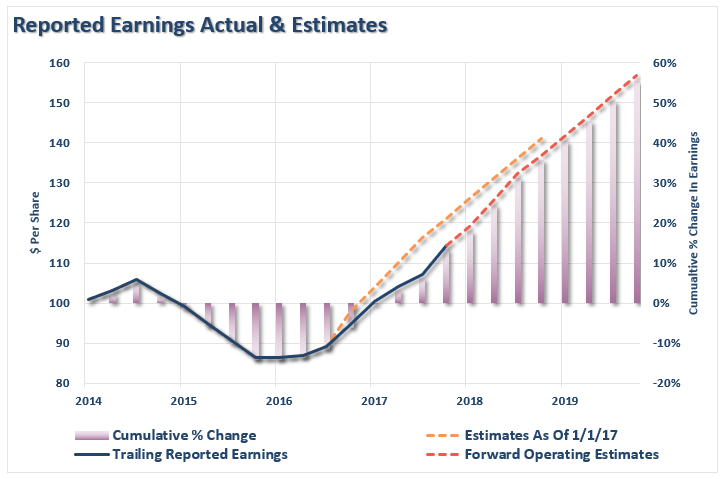 It is quite likely that once again Wall Street is extrapolating the last few quarters of earnings growth ad infinitum and providing even more fodder for the market rally. It is also quite likely Wall Street will be proven wrong on earnings as so often has occurred in the past. As I have addressed over the last few weeks, investors, both individual and professional, are overly exuberant and confident about the future of the market. Of course, Wall Street is notorious for missing the major turning of the markets and leaving investors scrambling for the exits. Will tax reform accrue to the bottom lines of corporations? Most assuredly. However, the bump in earnings growth will only last for one year. Then corporations will be back to year-over-year comparisons and will once again rely on cost-cutting, wage suppression, and stock buybacks to boost earnings to meet Wall Street’s expectations. The risk of disappointment is extremely high.